I love this image. In an online and ever connected world like ours, social media and even email can become huge distractions. 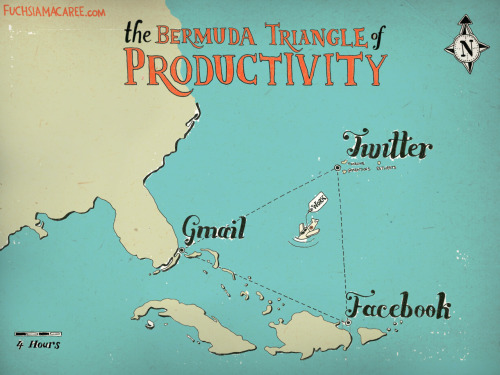 How do you know if your productivity is getting lost in this Bermuda Triangle? Do you constantly feel the tempting urge to check for new status updates, tweets and email messages that demand your attention? Do you tend to drop everything else every time you get a new DM, @ reply, a post on your wall or new email message? Maybe it is time to let go (for a while). When I was growing up and in school, the main distraction was the phone. Not not a smart phone but a regular-old-corded-attached-to-the-wall phone. Oh yeah, and the only thing you could do with it was talk on it – no texting, surfing or playing games. I’m not sure how I would have dealt with all of the competing distractions that face kids today. But it’s not just kids that have to learn how to balance all of the new ways of social interaction with other responsibilities. Adults need to as well and perhaps even more so. Like so many things, it might be even harder for adults to learn how. I am not saying that social media is a waste of time. It can be a very valuable and important communication and connection tool which gives us inroads and insights to people, customers and potential clients but it must be balanced. The same can be said about email and texting. While social media (and even texting) is a relatively new medium, email has been around for a long time and there are many who have become slaves to their inbox. The definition of our “inbox” changes as technology changes. Think about it, an inbox used to only be a physical box sitting on your desk or wall where mail and papers that you had to look at, work on or respond to would go. Now the inbox has become digitalized in many different forms, but just like with the physical one, we must learn not to become slaves to it, else we will find ourselves “busy” but not necessarily working on the right things or the best things. Question: How do you balance social media, email and work? Do you have a different three points on your triangle? Leave your comments here.